I honestly thought I would never be writing another post like this. After my third miscarriage was followed by almost three years of infertility we decided to stop trying. We felt it was a miracle that God had called us to adoption, as we found those doors opening I found myself completely releasing the desire to carry my own child. We were so excited to open our home to a child who needed us, to build our family through adoption. When I looked down at the pregnancy test on July 11 and saw two pink stripes I was shocked, we had planned on starting our adoption process mid August, once we had settled in to our new home. As the shock melted away it was replaced by giddiness. This was it. I had spent the first seven months of the year dealing with my “stuff”, truly healing, truly trusting God’s plan for our life. I had once and for all surrendered control and given it to him. I would hold this baby in my arms and say, “God did this”. It was all Him. And it was a miracle. It was a gift. It was all Him, and He is good. But I won’t get to hold that baby in my arms. seventeen days was all we had. Seventeen days of prayer, of trusting, of turning everything over to Him. I spent my time telling my child of the Goodness of God, of His love for us. I spoke the truth of who He is over my baby. I don’t understand. I am aching for her, even as I see my body go back to “normal”, even as the tears come. I had forgotten how deep this pain is, these first days after a loss. The pain of missing someone I never got to meet, the grief of losing all the dreams I had of her, from what we would dress her in for our trip to Disneyland next summer to where she would go to school, to who she would become. Years of teaching her about kindness and humour and everything life has to offer. We didn’t just lose a “ball of cells”, we lost a life. In the midst of heart ache I am leaning on God, more than I ever did with the other three. My relationship with Him has grown deeper this year. In the past I have felt betrayed, angry, forgotten, now I feel Him close to me. He is grieving with me, weeping with me. We thought we were past the wilderness, it looks like we’re still wandering, but he’s doing a new thing, he’s making a way. There are streams of peace and love and care in this wasteland. October is Pregnancy Loss Awareness Month. 1 in 4 pregnancies ends in loss (miscarriage or still birth), and that’s just an estimate because so many losses go unreported or happen before a woman even knows she’s pregnant. I have lost three babies through miscarriage. August 2013, September 2014 and August 2015. This was the first summer in 3 years that I did not get pregnant. After my first miscarriage I didn’t know how to talk about it. I felt like I couldn’t talk about it. I was embarrassed and I didn’t want to make people feel uncomfortable. But I needed to talk about it. I never want anyone to feel like they have to keep their loss a secret if they don’t want to. There are certainly people out there who don’t need to talk about it and don’t want to talk about it and that is fine too. However, there are people who, like me, need to talk it out, need to express their pain, need to remember their little ones. I talk about Pregnancy Loss because when I lost that first baby I lost part of myself, I became a new person, it changed me forever and I couldn’t talk about it. This October let’s change the way we talk about Pregnancy Loss. Let’s allow couples to open up about the very real pain of losing a child before they’re even born. Let’s stand by them as they navigate what pregnancy and parenthood means after a loss. Let’s stop making miscarriage a taboo subject. Let’s talk about it. Let’s cry about it. Let’s stand up and say, “I am 1 in 4”. I’ve written and deleted four posts in the last hour because they turned out to be depressing and truthful a little too blunt. While I have no problem sharing that side of this journey I didn’t want this post to be about that – so I had a good cry and here I am to start again. I am having a difficult time balancing my desire to celebrate the mamas who have their babies here on earth and spend every day teaching those littles “How to Human” and my desire to give recognition to the mamas who are grieving empty arms and empty wombs this Mother’s Day. So I’ll write a little message to both sets of mamas and hope I can express what is in my heart. To the first set of mamas: you are heroes. The responsibility of raising tiny humans is astounding and I am amazed by all that mothers do. To the second set of mamas: you are heroes. It is not easy to live life while grieving. It is not easy to know you are a mama and not have the baby or the bump to prove it. It is not easy to look at your family and know someone is missing. It is not easy to sit in church on Mother’s Day when no one knows what you’ve been through and wonder if you should stand up when they ask the moms to stand for recognition or come to the front for a flower. Maybe you’re watching the kids who are the same age as your baby should be as they bring their mommy a card covered in glitter and pasta and stickers with Jesus’ face on them and thinking about how big they’re growing and would your own baby be colouring inside the lines by now? Know that you are not alone, I have been there and will most likely be there again today. For all of the mamas, Happy Mother’s Day. Thank you for being a mother, thank you for being brave, thank you for being heroes. It seems fitting that your birthday is the first of our “difficult days”. Spring and summer are filled with cruel reminders of what we have lost. From due dates that have passed (or will pass for the first time), to Mother’s Day and Father’s Day, to the anniversaries of three discovered pregnancies followed by three miscarriages, the months from March through September each have at least one day where we are aching for you and your siblings. Your birthday (aka the day you would have been due) is the first though, and it is fitting because you were the first and my pregnancy with you was special. I had somewhere between twenty and twenty five days with you – knowing you existed- and those days were some of the happiest of my existence. You were my longest pregnancy and the only one untouched by fear. We were so blissfully unaware of what the next two years would hold and we were just so excited about you. I was so tired. Daddy and I were both working at the same church that summer and we would go home for lunch (we lived close by) and he would make lunch and I would sleep for half an hour and then eat my lunch at my desk when we got back. With every pregnancy I have craved leafy green veggies and fresh things but with you I also really wanted orange juice and gummy worms. It was too soon to have “pregnancy cravings” but that’s what I wanted to eat those weeks with you. We did so much research in those few days. Strollers and car seats and cribs, things we didn’t need to worry about for months but we just couldn’t wait, we wanted you with everything we had. This was before Pinterest had “secret” boards so I tried to be really careful about pinning because I didn’t want to lie if anyone asked if I was pregnant. I wish we could have kept you. Held you. Seen your heart beat. Daddy never even got to see an ultrasound. We love you so much and are so thankful for the days we had with you. You changed my life, son. We named you Peter, sort of as a joke (sorry), after Peter Pan (because you were our lost boy) but as I was looking for a name this past summer for your brother I realized how fitting your name is. Peter means “rock”. The year that followed our loss was so life changing and I will always look back on it as a year of building a strong foundation. Because of you your father and I learned so much about each other, about how to love each other and about God and His love for us. Because of you I have had the opportunity to speak to and comfort other mothers who have lost their babies far too soon. Because of you I knew to cherish each day that I knew I was pregnant with your sister and with your brother. God has been so good to us through all of this. He has walked along side us and comforted us, I know He has wept with us. You are so lucky that you get to spend all of eternity with Jesus. I wish I was getting ready to throw you the best 2nd birthday party ever, but I bet heaven is more fun than anything I could put together. We love you Peter, happy birthday. Day four of my Candida cleanse. After three days of upset stomach and headaches I felt pretty good. Until the sugar cravings started calling to me. I ate a spoonful of natural cashew butter but it wasn’t cutting it. I looked at my tea station…honey. I took the plastic bear out of its shelf, took another spoonful of cashew butter and had the bear open ready to pour. 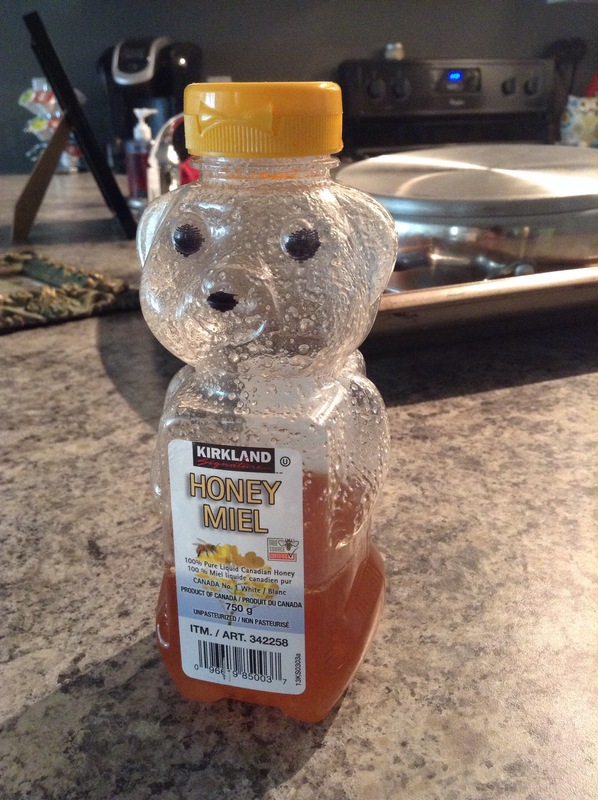 The faces of my little babies flooded my mind and I put down the honey. This is for them, this for the future babies. Health and wellness and ability to conceive and carry a child to term. This is why I’m doing this. In eleven days I can have fruit again and it will be a joyous day, but for now I’m dropping the bear and sipping herbal tea and thinking about this year to come. Today is the last day of 2015. Over the past few days we have moved from BC to Alberta, moved into a new apartment (on the third floor…with no elevator), bought a new car, visited an Ikea that is seven minutes away (with no toll bridge in between home and Ikea!) and prepared for Austin to start a new job on Sunday. The last few months have been such a whirlwind. Our last miscarriage happened in August and a few days after I lost the baby we were interviewing for this new job for Austin. I really had a hard time with this loss. I thought it was worse than the other two. Austin says I was the same with the other two but this one felt different, there was more fear attached to it, I felt like a third miscarriage meant that there was something really wrong with me. It took me a really long time to get my act together and go to the doctor. Every time I picked up the phone to make an appointment I would just start to cry and have major anxiety. I knew everything was okay physically because I had gone through it twice before so I knew what to look out for, and my periods started normally afterwards, but I probably still should have gone in just to be sure. Don’t follow my example. All that to say, 2016 is going to be the year of the Toews Baby. Whoa, whoa, whoa, settle down, I’m not pregnant. I am simply starting 2016 determined to get healthy, get my weight and blood sugar under control and eventually get pregnant and have a healthy, wonderful pregnancy. Stay tuned as I take on this venture and focus on health in 2016!